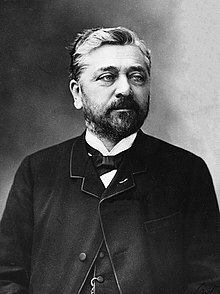 Alexandre Gustave Eiffel (December 15, 1832 – December 27, 1923; French pronunciation: ​[efɛl], English: /ˈaɪfəl/) was a French structural engineer and architect. He is known for designing the Eiffel Tower. He also designed the armature (supporting framework) for the Statue of Liberty, New York Harbor, United States. This page was last changed on 26 April 2018, at 08:30.